Fully Revised and Updated for the HIPAA Final Rule! Business Associates (BAs) must now comply with nearly all of HIPAA. Be compliant, be safe, and teach your workforce what they need to know about HIPAA. Basic HIPAA Training for Business Associates satisfies the new HIPAA requirements for BAs in a brief and cost-effective course. This online training delivers precisely the HIPAA know-how Business Associates need, and emphasizes practical knowledge to assure compliance and avoid HIPAA violations. Learners appreciate the simple interface, clear content, and highlighted quiz content that makes it easy to learn and pass the course. Managers love the unique setup and admin features no other online course offers. With Basic HIPAA Training for Business Associates, any number of trainees can register and login to the system in seconds. From a few employees to thousands, signing-in and using this HIPAA training is quick and painless. Management starts the registration process with a simple email to employees. A link in the email leads to the registration page. Once there, trainees enter their name, email address, and a unique Client Code, and they are registered. This one-time registration process takes less than a minute. Once registered, trainees can login any time and take the course and the quiz all at once, or in sections - at their own pace. With Basic HIPAA Training for Business Associates, management control of the training process is built right into the training system. Managers can login securely at any time and see which employees have started or completed the training. Managers can also post messages on the system to their entire group; and Quiz scores for all trainees are instantly available too. HIPAA training just doesn't get any easier than this. Every learner who completes the course and quiz earns a beautiful, customized Certificate of Completion with their name, date, course title, and organization name. Learners can print, save, and even email their Certificate from inside the training system. 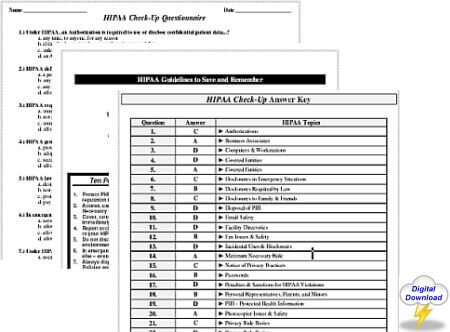 And every Certificate also includes a free copy of HIPAA Group's exclusive "HIPAA Awareness Card", summarizing HIPAA's core do's and dont's in a handy, card-sized format. Great training plus long-term awareness is exactly what every HIPAA-regulated entity needs. Two easy-to-understand sections teach learners about HIPAA, and more importantly, how to work with HIPAA on the job. 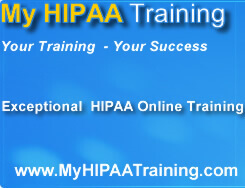 Basic HIPAA Training for Business Associates is delivered via the Internet to any Net-capable PC. No special software, hardware, or connections are needed. This targeted HIPAA training delivers tangible benefits, and fully meets or exceeds HIPAA's legal requirements for training on Privacy and Security. No matter what industry you are in, no matter what kind of Business Associate you are, Basic HIPAA Training for Business Associates will prepare your team for HIPAA and reduce your risk of HIPAA violations. Basic HIPAA Training for Business Associates is brought to you by HIPAA Group, Inc., a national leader in HIPAA compliance. HIPAA Group has trained thousands of people on HIPAA, including physicians, nurses, medical staff, Privacy Officers, Security Officers, managers, CEO’s, attorneys, and Business Associates. Buy Four or more licenses and receive an additional license Free. This product is a Training License. One License is required for each person to be trained.